The NEXTFLEX® Myeloid Amplicon Panel allows you to quickly target and sequence 105 selected exons from 21 different genes loci. This kit contains primer pairs and reagents needed to amplify these coding regions from DNA isolated from fresh or frozen material, and prepare libraries for Illumina® sequencing. 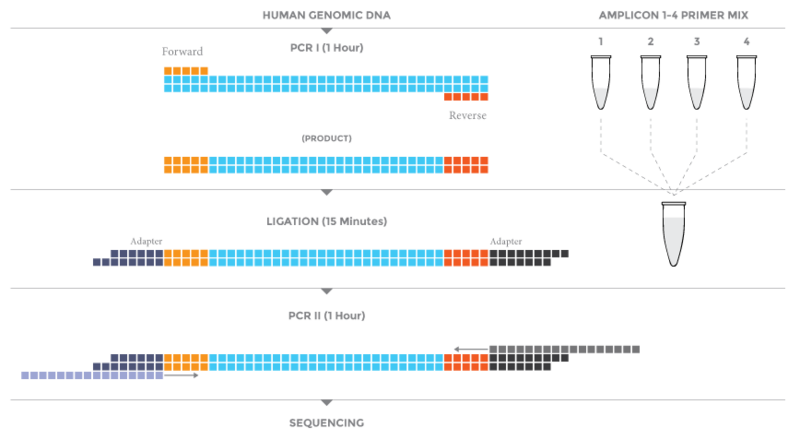 The NEXTFLEX® Myeloid Amplicon Panel has the capability of multiplexing up to 4 samples at 2000x coverage for detection of somatic mutations on a single Illumina® 2×300 MiSeq® lane. The NEXTFLEX® Myeloid Amplicon Panel is a complete, validated solution that targets 105 selected exons from 21 different genes loci using 270 PCR primer pairs. This kit requires only 40 ng of DNA isolated from fresh or frozen samples. The convenient predesigned panel allows researchers to focus on data generation and analysis, not on labor-intensive primer design and target selection. This kit can be easily automated on liquid handlers, further simplifying workflow. The NEXTFLEX® Myeloid Amplicon Panel contains enough material to prepare 8, 48, or 96 samples for Illumina® sequencing from DNA isolated from fresh or frozen samples. The shelf life of all reagents is 12 months when stored properly. All components can be safely stored at -20°C.